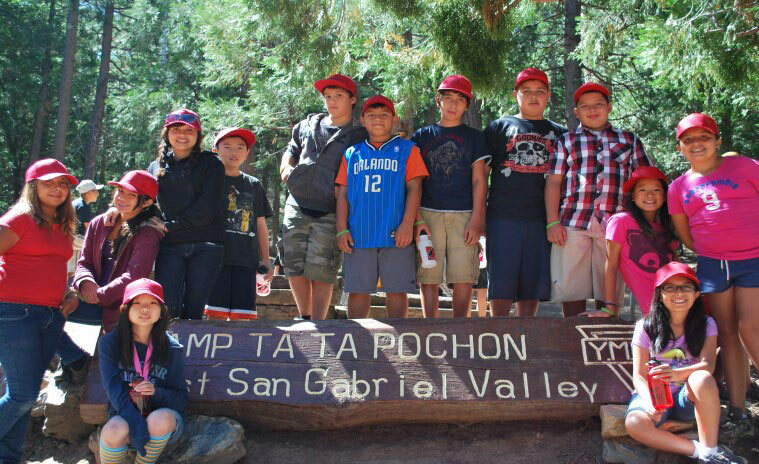 Each year, the Alhambra Police Department sponsors a youth camp in the San Bernardino Mountains for over 100 children of the Alhambra community called C.A.M.P. — Children And Mentors Program. Children attending C.A.M.P. are never charged a fee to participate. 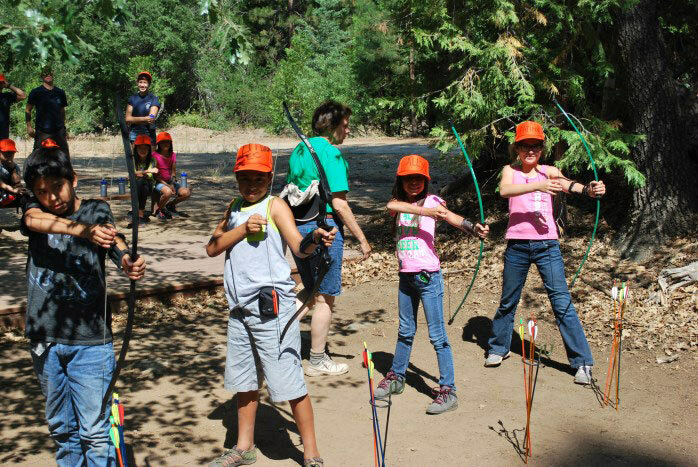 The camp is funded solely by donations and fundraising efforts. The C.A.M.P. Golf Tournament has been the main source of funds to pay for camp and all related expenses for the last 20 years. Your support is appreciated! Limited Participation: Space is limited and spaces will be assigned only when payment is received — no exceptions. The entry fee includes green fees, golf cart, tee gift, lunch, awards ceremony and dinner. * In-N-Out Burger will provide lunch from noon to 2:00 pm for all golfers. Tournament Presenting Sponsor: 3 foursome, 12 lunches and dinners, 3 Tee signs, banner at registration, opportunity for company representative to speak at golf awards presentation, and recognition on all press releases and printed material. Your company logo on the Alhambra Police Foundation’s website for one year. Platinum Presenting Sponsor: 1 foursome, 4 lunches and dinners, program evening recognition, 2 Tee signs, company banner at registration (sponsor to provide), and recognition on all press releases and printed material. Gold Sponsor: two golf spots, 2 lunches and dinners, and one Tee sign. Silver Sponsor: one golf spot, 1 lunch and 2 dinners, and one Tee sign. Tee Sponsor: one Tee sign. You can download the registration and sponsor form here. 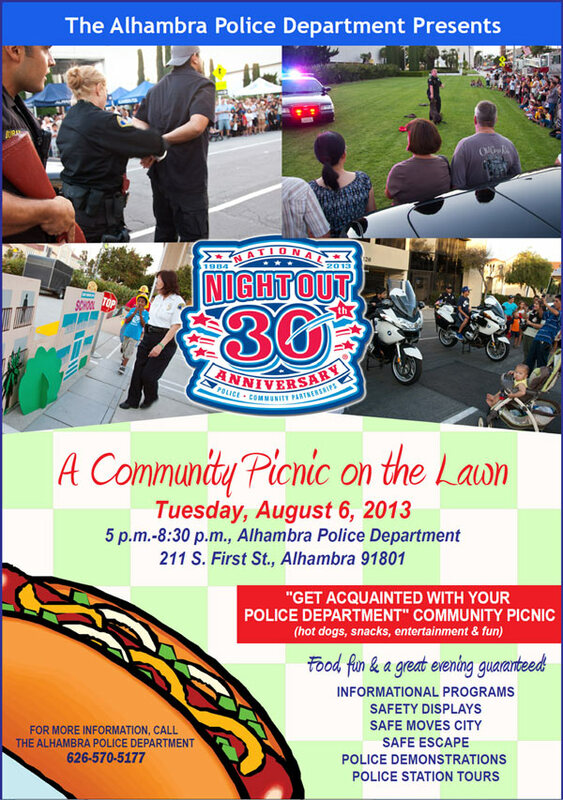 Join the Alhambra Police Foundation on August 6 at A Community Picnic on the Lawn, from 5PM to 8:30PM. The address is 211 S. First St., Alhambra, CA 91801. We will have a booth, so stop by and say hello!